Jennifer Lizbeth Vega Castrejón is 14 years old and lives with her parents and 3 siblings. As the oldest child, she is currently in middle school. Her oldest brother is in elementary school, one brother is a pre-schooler and the youngest is only one year old. Jennifer is a teenager who likes to play soccer but does not have time to practice. Instead of having a simple childhood, she is dedicated to the care of her younger siblings while her parents work to make a living. Her wish is to have a room of her own and some privacy. Her current home, a one bedroom that houses the entire family, does not have the proper space for a growing family. Moreover, Jennifer’s community does not have electricity. 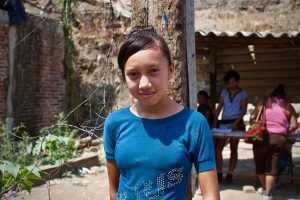 In addition to these basic necessities, she would love to have a daycare in her community where she could take her siblings while she studies and does activities of her own. She would also like to receive training to become a stylist. Her ultimate wish is that Project Boon help her pursue a medical or master’s degree.